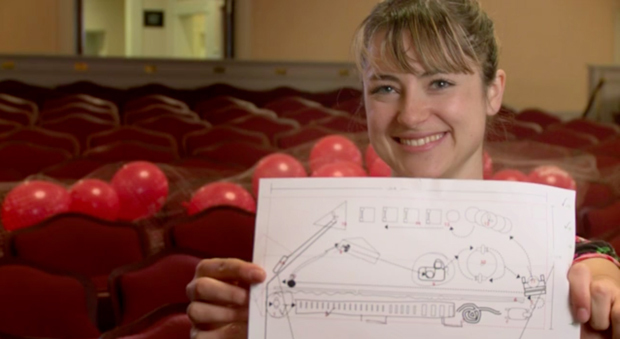 Last fall, when most of Syyn Labs was hunkered down in its Los Angeles warehouse building a Rube Goldberg machine for the Google Science Fair, Heather Knight was building one to kick off PopTech, the brainy and fun annual conference in Camden, Maine. PopTech’s video on the making of Knight’s creation just came out, and it’s a must-see. Syyn’s usual performances on film are, by nature, misleading. It’s easy to mistake the single shot of continuous action in Syyn’s Google, Disney and OK Go machines as the norm. In fact, the OK Go device required 85 takes before the entire series of interactions made it to the end without failing. A rolling billiard ball would miss its target. A chair wouldn’t tilt over. Whatever the trigger, it didn’t work. The Rube Goldberg machine may be a star, but as a performer it’s a nightmare. Knight had to build a more reliable machine for the opening of PopTech. For the most part, it works, eventually showering the audience with hundreds of balloons. When it stalls, though, in a hilarious bit of off-stage directing, she flings a book to trigger the next action and get the thing moving again. Watching this, you realize what an astonishing feat it is that Syyn gets a machine to complete dozens of interactions without fail, even one time. Don’t miss another video of Knight that’s making the rounds online. Her TED talk from December features a joke-telling robot, which is part of Marilyn Monrobot, her robot theater company.